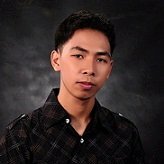 How to offer 10% discount for 5 or more orders using quantity field? Hi there. The question looks really easy but I'm having trouble getting it to relate to my needs. 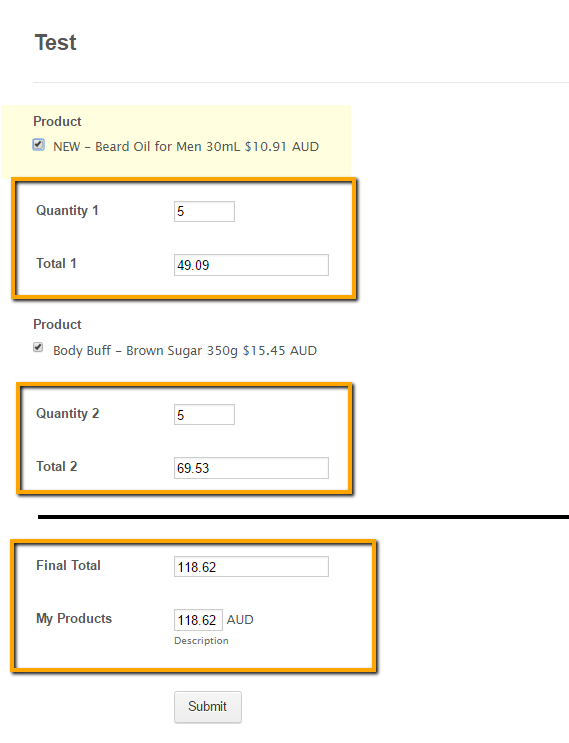 All I want is some of our products (but not all) to have a 10 per cent discount when the customer orders 5 or more (using a Quantity field). But the new layout doesn't seem to have the same options? Your help would be greatly appreciated because I don't want to use the "special pricing" feature because then I would need to add a ridiculous amount of numbers in the dropdown field. Unfortunately, your requirement is not possible to achieve in the payment field without using the Special Pricing feature. A possible workaround would be to use regular number fields as your quantity field and then use the Calculate condition to calculate the discount. Please allow me some time to setup the guide. Regards. 1. 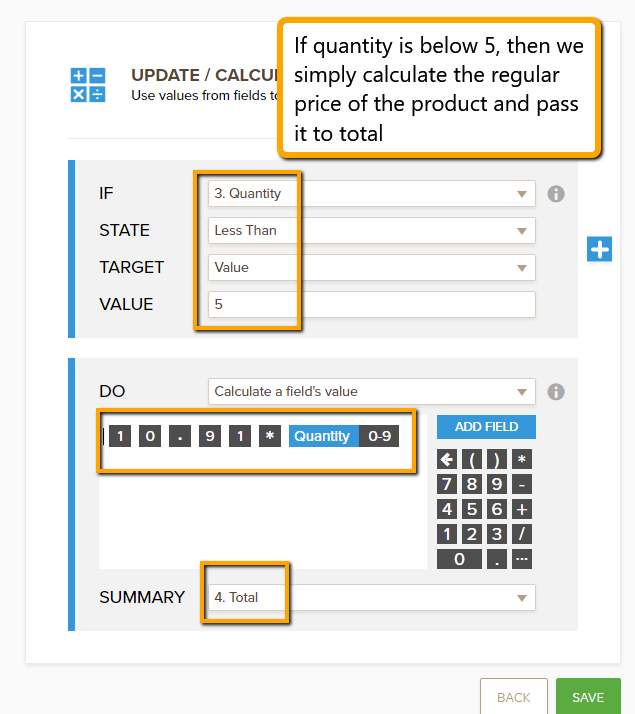 Add a number field as your product's quantity. 2. 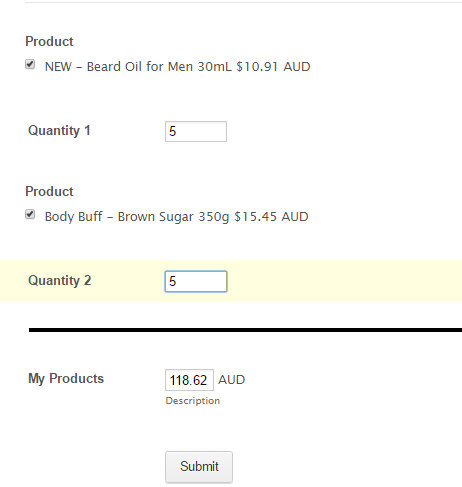 Then add a calculation field where we will pass the price based on the quantity. 3. 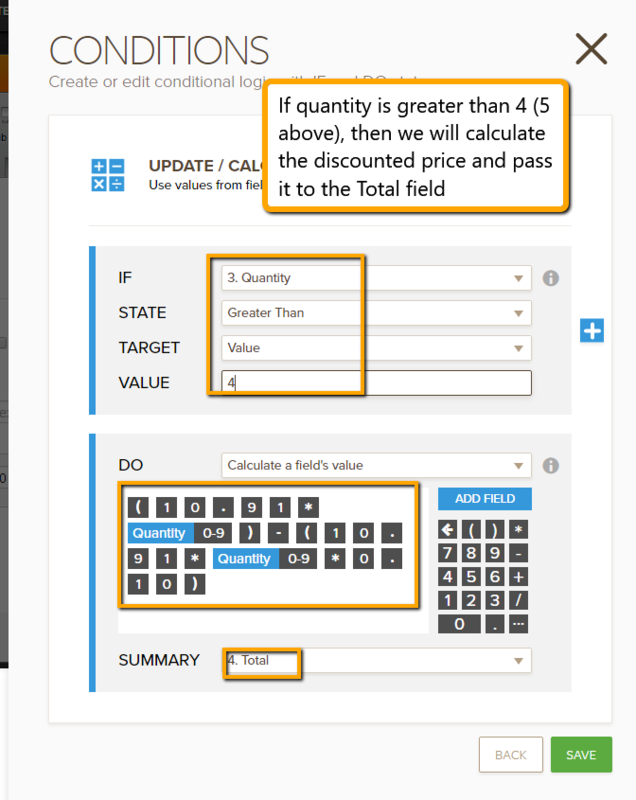 Now we add a Update/Calculate condition for the quantity field. 4. If you have more products, follow the steps 1 to 3 for the rest of the products. 5. 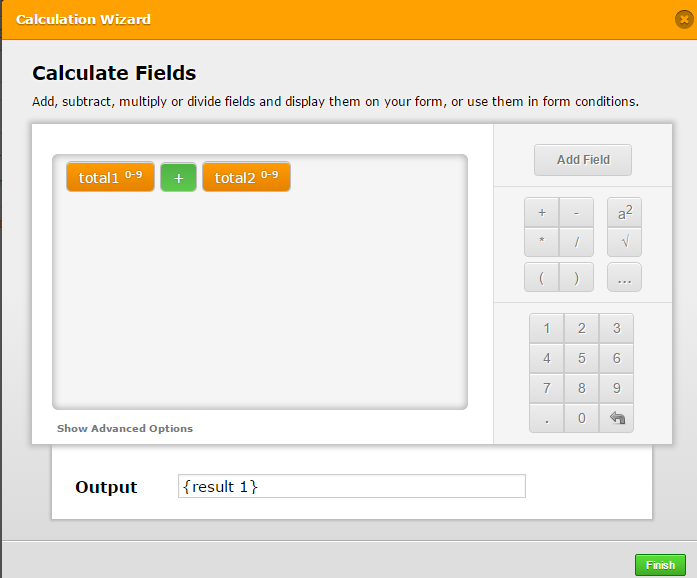 Now we add a Final Total calculation field. This is where we will calculate the total price that the user will be charged with. 6. Add the payment field to your form and select Custom Amount. To get the amount from the Final Total, please follow this guide: How to pass a calculation to a payment field. Once all is setup, you should now have a form that will provide a 10% discount for selected products. You can also hide the "Total" and "Final Total" calculation fields from your form to make it easier to view. Thanks for your reply and working this out. I have played around with it and it certainly would work, but I can't do it under the product wizard, therefore having nice product picture thumbnails (I also use the Lightbox app). While this is a great workaround, it does not appear to be a solution for me. Thanks so much, I'm sure your hard work will benefit someone else more directly. I'll have to stick with the 5-pack separate items for now - it means people can't get the discount unless they order multiples of five but that doesn't really hurt anyone. Thank you for updating us on this concern. I understand that you prefer to have the Product Lightbox for the images which can only be used with the payment field, so this solution may not be suitable for your specific requirements. Your workaround looks like a great alternative. If you have any other concerns, feel free to contact us again. Cheers.